Carron Court residents enjoy their brand new garden furniture. Residents at Bield Housing’s sheltered housing complex at Carron Court, Bathgate, can now socialise in the sunshine, thanks to a community grant from Scotmid Co-operative. Scotmid awarded a grant of £200 to purchase new garden furniture to enable tenants to utilise their garden areas and spend quality time outdoors together. Jennifer Marshall, Carron Court Manager, said: “The tenants at Carron Court take great pride in their scheme and have worked hard with staff in the past to run fundraisers for various garden projects, so that they may fully utilise and enjoy their garden areas. 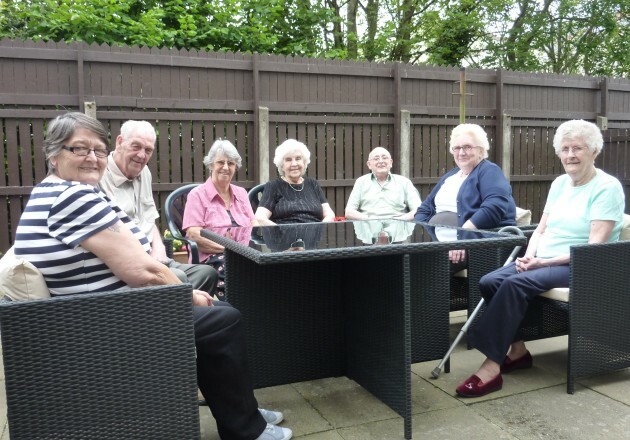 Bield Housing ensured that residents were involved in the purchase of the new garden furniture, giving them the chance to vote for their favourite set. She added: “The set has now been purchased and they are absolutely over the moon with the results. It has even spurred them on to aim for a bigger goal of setting up a greenhouse in this area next spring, which will be a wonderful hobby for many.